Ever wonder how our ancestors always seemed to have food on the table even in lean times? When we are visiting the grocery store every week to the tune of hundreds of dollars, we long to know their secret. In fact it isn’t a secret at all. It is actually good planning and preparation on their part. Once we realize this and begin doing as they did, we too will see our dollar stretch further. Flour is a starter item for many recipes. You can add it to some water and make gravy in the pan for many meat dishes. 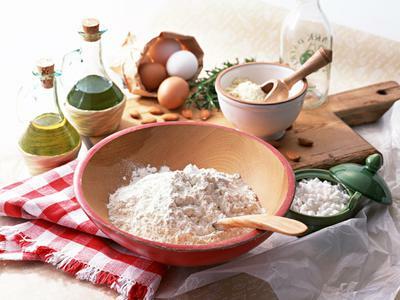 Flour is used to make bread (biscuits, rolls, loaves) and to coat chicken. It can also be used to coat a round or square cake pan to prevent the cake from sticking. Of course, one of the favorite uses for flour is in cookie recipes that make scrumptious desserts. My husband loves rice so much that we once bought a fifty pound bag from a grocery store in his hometown. Fifty pounds! Rice is a side dish, but it doesn’t have to be plain. It can be jazzed up with veggies to accompany dinner. My mother uses leftover rice for a dessert called sweet rice. Just add evaporated milk and some sugar to a bowl of rice and warm it in the microwave. It is a tasty treat for after dinner. Another popular dessert is rice pudding. Rice can also be mixed with leftover meat and a cream soup to form a casserole. Rice has many uses and your sure to find a few that your family will love. There are many different pasta choices and all have great uses. Manicotti can be stuffed with tomato sauce and cheeses. Macaroni can be used to make a creamy salad and also is great combined with cheese or spaghetti sauce. Spiral pasta is used in many different pasta salads. Spaghetti can be used in a casserole topped with cheese or in the traditional way with tomato sauce and meat. There are other ways to season food besides salt and pepper. In fact, many spices taste better than salt. Even diehard salt-a-holics won’t miss the salt in foods if other seasonings are used. Cayenne pepper, chili powder, nutmeg, cinnamon, oregano, and garlic powder are all useful tools in your flavor arsenal to give foods a fresh new taste. There go those beans again. Beans can top your salad (edamame), make an awesome dip (black beans), and go well with grilled foods (baked beans). They provide a good source of protein with very little fat. Beans are good in soups, stews, and over rice for a simple yet filling meal. Do you have these staples in your kitchen? You can probably think of several more that will enhance your pantry and save money. Start with these and grow your own list of basic kitchen staples that are versatile and economical.